Matt Duchene. Credit: Marc DesRosiers, USA Today Sports. 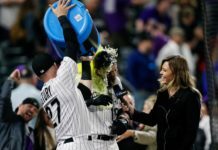 The Avalanche are in dire need of some home cooking, finally coming back to the Mile High City after going 1-4 on their five-game road trip through the great white north. 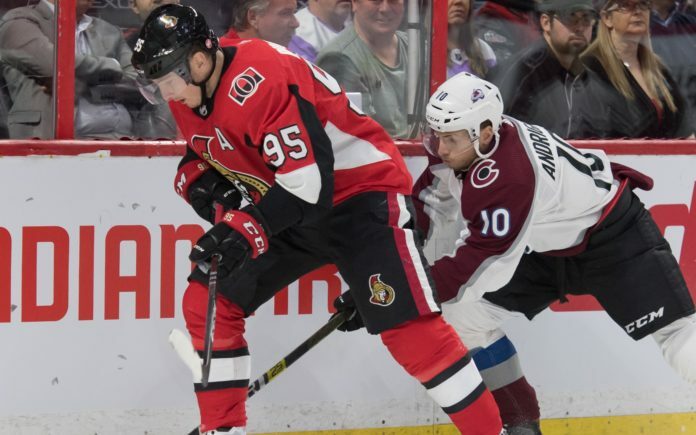 Matt Duchene scored two goals and added one assist as the Senators beat the Avs 5-2 on Wednesday night. Looking to build off of their impressive win over the Toronto Maple Leafs two nights prior, Colorado was rather slow to start the game against Ottawa failing to record a shot on goal in the opening minutes and losing the first-period shot count 13-8. Semyon Varlamov made a handful of big saves in the first to keep the Avalanche afloat, but Colorado failed to get one past Ottawa’s Anders Nilsson and the first period ended with a 0-0 tie. The Senators hit the ice for the second period looking to take over, and they did, scoring at basically two and three minutes into the period. Brady Tkachuk was the one to open the night’s scoring after he put away a rebound from right in front of Varlamov. The second goal was scored by Mark Stone after he tipped a shot from Cody Ceci that trickled past Varlamov, who even got a piece of the shot. Not long after, at 9:01 to be exact, Ottawa’s Ryan Dzingel added another goal to the scoreboard and, considering the way the Avalanche have struggled lately, Colorado’s confidence was shot yet again. The Senators led 3-0 and were dramatically winning the possession battle. Finally, the Avalanche got on the board; Nikita Zadorov was able to get one past Anders Nilsson for his fourth goal of the year with 1:07 left in the second. Zadorov’s slapshot from the point went top shelf through a crowd and was quite the spectacle, yet the intermission quickly put a damper on any momentum the Avs could build from the Russian bomb. Pouring salt on the Avs wound was former Colorado forward Matt Duchene, who scored two goals and one assist on the night. His first came just under halfway through the third period, putting home a rebound past his old teammate. His second goal would be on an empty-netter to close out the game. Duchene has now scored two goals in each of the two games against the Avalanche this season. Nathan MacKinnon was able to add a late power-play goal — his 27th of the year — with 3:59 on the clock. 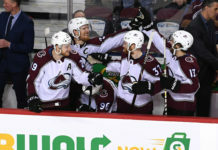 However, his efforts for a comeback were futile as the game was out of Colorado’s reach at that point, with the Avalanche losing 5-2. After spending five games on the road, the Avalanche will now head home for a much-needed five-game stretch. It all begins with a matinee game Saturday against the Los Angeles Kings, followed by matchups with division foes the Nashville Predators and Minnesota Wild. In order to avoid further disaster, the Avalanche will have to take care of their home ice and bounce back in the standings. 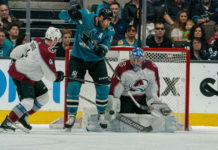 After the Canadian trip which was one of the uglier five-game stretches of the year for the Avalanche, they will now have to prove to the hockey world that they aren’t the sinking ship everyone now considers them to be.